Made from 2mm mild steel. Joins 25mm square tubing only. View and like facebook page and meet other customers. Submit your email address for a price list. Alternatively contact Hannes in Pretoria East directly on Cell: 0825621140 or email: sales@openshop.co.za. Steel Tube Connectors are made of 2mm mild steel and is used on 25mm square tubing. Steel Tube Connection system linking together a plurality of tubes without welding, involving relatively low cost production and material costs. Building frame structures with these connectors allows for firm and strong connections to be made without the need for welding, grinding, drilling, jig fixtures and more importantly electricity supply. The design of these durable external connectors is manufactured from an integral sheet metal stamping. The square tube is clamped in between the two halves of the connector. 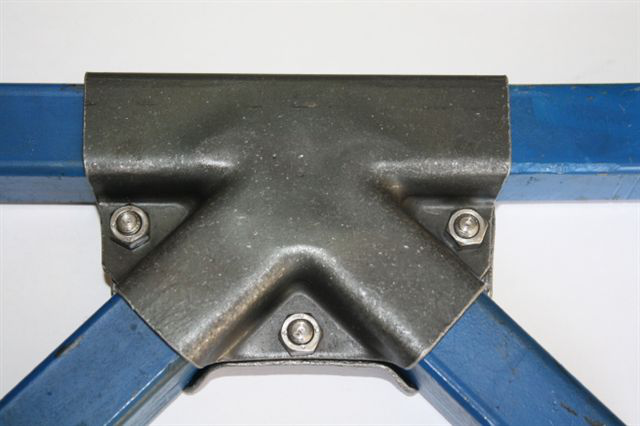 The 2 halves are secured together with a galvanized 6mm hex screw and nut. The screws and nuts are only used to secure the halves and not intended to aid with the strength of the connector. The connector fits perfectly around the 25mm (1 inch) square tube providing stability and structural strength. Because welding is eliminated, any assembly can be dismantled and rebuilt using the same connectors and tubes. This allows for all the materials used in the assembly to be re-used even on different structures so long as the tubes and connectors are not damaged during dismantling and re-assembling. Existing assemblies can be modified by simply releasing the connector, adjusting the length of the tube to suit and re-assemble.